Instead of stressing about public transportation or trying to flag a taxi, choose our cost effective private transfer, so your holiday in New York City can begin hassle-free. Our driver will meet you at New York's JFK airport and take you to your hotel. Regardless if you are traveling alone, as a couple, or in a large group, our experienced, professional drivers will ensure your transportation to and from JFK airport is a breeze! 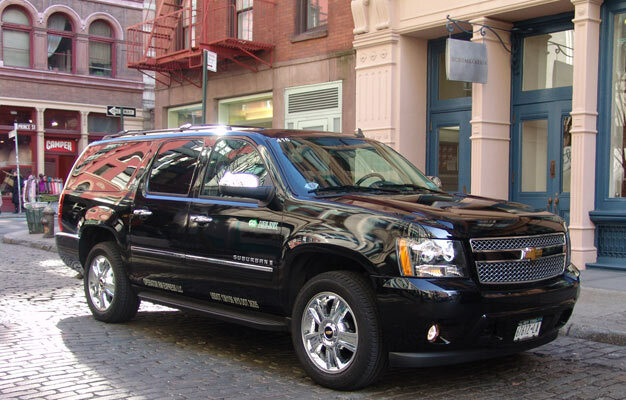 This is the most relaxed, efficient and private transportation between JFK airport and your hotel. Our door-to-door policy ensures transportation both to and from your hotel and JFK airport. Just book your private JFK airport transfer, and you will be met by your very own driver inside the airport. If you wish, you can also purchase return transportation from your hotel back to the airport. Shortly after your booking is complete, you will receive an e-ticket by mail. Please print out your ticket and bring it with you to JFK Airport. When you arrive in the airport, you will be met by a professional greeter with a sign with your name on it. The greeter will help you with your luggage and bring you to your awaiting car and driver. If you wish to book a return private transfer to JFK Airport, you have to place two orders: One from the airport to your hotel and one from your hotel to the airport as every booking needs its own confirmation number. If you have booked a return transfer from Manhattan to the airport, you are all set, and there is no need to reconfirm your pickup time. However, please call the local phone number clearly marked on your ticket should you require any assistance. It depends on how many people are in your party. You can choose between a sedan service if you are between 1-3 passengers, a VIP SUV if you are between 4-6 passengers and a van if you are between 7-10 passengers. This service only operates in Manhattan - your hotel must be located between Battery Park and 125th street. You are allowed one standard suitcase and one piece of hand luggage per person - up to the passenger limits per vehicle. The price includes all taxes, tolls and gratuities. Note: The prices listed on our website are per car, not per person. Are there exceptions for children? No, the number of allowable passengers per vehicle remain the same - regardless of child or adult.